First look at director Yen Tan's '80s set drama. Writer/director Yen Tan's shot on black and white 16mm drama, 1985, takes us back to the year in question, when a New York advertising exec (Cory Michael Smith) returns to his conservative Texan family for the holidays, weighed down by an AIDS related tragedy back in the Big Apple. Jamie Chung, Virginia Madsen and Michael Chiklis also star. 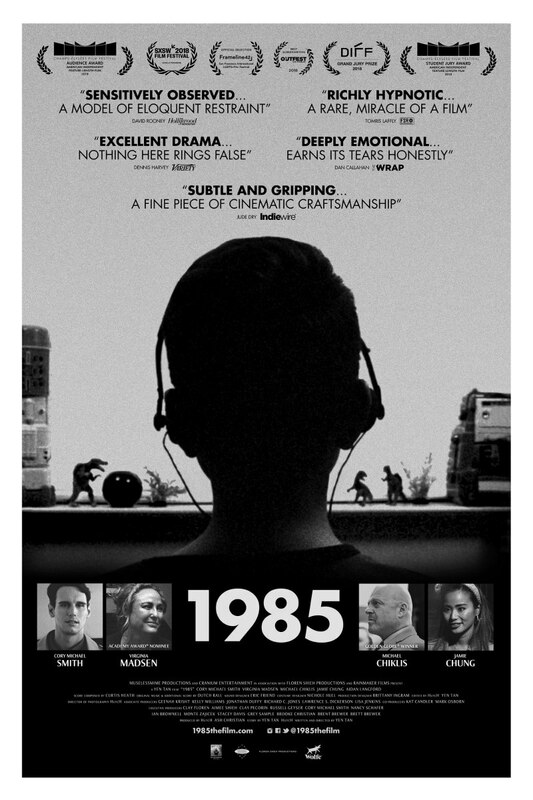 1985 is in US cinemas in October, but a UK release has yet to be announced. Check out the US trailer below. Having been gone for three years, closeted advertising executive Adrian (Cory Michael Smith, "Gotham") returns to his Texas hometown for the holidays during the first wave of the AIDS crisis. Burdened with an unspeakable tragedy in New York City, Adrian looks to reconnect with his preteen brother Andrew (Aidan Langford) while navigating his relationship with religious parents Eileen (Academy Award Nominee Virginia Madsen) and Dale (Golden Globe Award Winner Michael Chiklis). When he reaches out to his estranged childhood friend Carly (Jamie Chung, "The Gifted"), their unresolved issues force Adrian to confront an uncertain future that will significantly alter the lives of those around him.